This walk is approximately 9.2 miles long, takes 3 1/2 - 4 hours and requires strong boots. 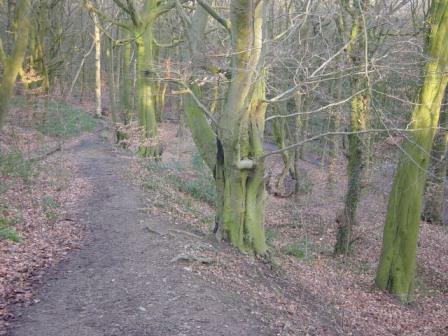 When I walked it the ground was frozen but under other conditions some of the paths will be extremely muddy in places. In terms of terrain, the first and third sections are level, the second and fourth gently down hill and uphill respectively. 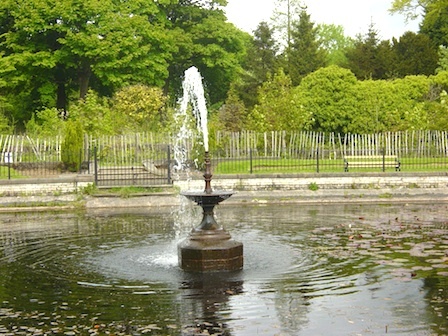 Start at the Haigh Hall car park SD 59679 08787 (charges apply). 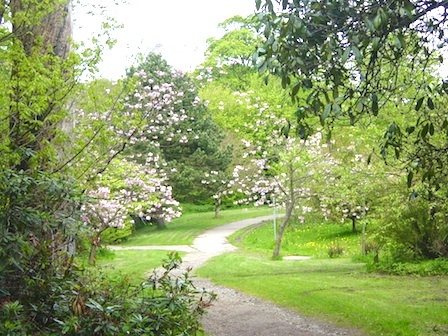 Walk down the main drive to the hall, turn left towards the stables and take the high level path past the fish pond and the walled gardens. Keep straight ahead and exit the estate at the plantation gates Higher Lane. Turn right then take the marked footpath on the left just before the bridge SD 60300 07874. At the fork take the footpath to the right. On reaching the housing estate continue to the end of the street and turn right to emerge onto Wigan Road. Turn left along Wigan Road and cross over, turn right into Woods Road 50 yards on the right (Signposted bridleway) SD 61065 07974. Continue along this path for a mile or so, at intersections keeping to the left. Emerge eventually onto Hall Lane approximately 150 yards below St Elizabeth's Church SD 61919 07371. Turn right towards Hindley, after about 100 yards look for a track on the left. It's not signposted but it is directly in line with Aspull reservoir which should be visible in the distance. Take this track, at the reservoir SD 62352 07310 turn left then right onto another track which leads past a number of houses into the top of Borsdane Wood SD 62904 07284. Follow Borsdane Brook through the wood until you reach the railway at the bottom SD62480 05320, go through the tunnel under the line and turn right into Danes Avenue.Walk along Danes Avenue for about 500 yards, take the footpath on the right. The footpath emerges onto Deansgate/Hilltop Fold, take a left and a quick right into Margaret Street and emerge onto Ladies Lane. Turn right up Ladies Lane, at the station take a left turn into Highfield Road, continue along the track which at some point becomes Hemfield Road to its junction with Makerfield Way. Continue straight ahead, bear left near the Council re-cycling centre then turn right onto the disused railway line (Whelley Loop) 50 yards ahead SD 60890 05540. Cross Belle Green Lane, the Leeds and Liverpool Canal and Wigan Road at the site of the old Whelley Station. Continue to the Iron Bridge carrying the main driveway from the plantation gates to Haigh Hall over the disused line (it's the first one you come to beyond Whelley) SD 59700 07400. Pass under the bridge and scramble up the bank on the left to join the driveway and turn left towards the hall. 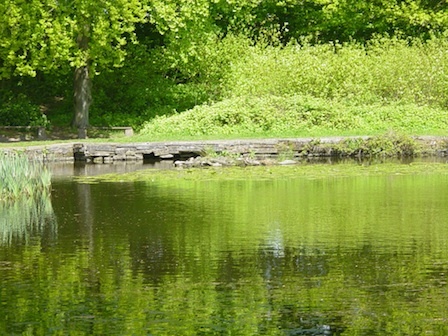 Cross the Leeds and Liverpool (Lancaster) Canal and follow the driveway past the Hall and continue to the starting point at the car park. Moss Eccles Tarn, Abbey Lakes - Coppull Moor Walk, Chorley Ice Cream Walk, Douglas Valley Dawdle, Three Counties Cycle Ride, A Lancashire Linear Walk, Blackrod or Bust, Cycle the Sankey Valley, Cycle the Monsal Trail. 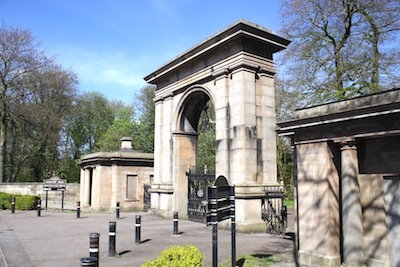 Picture - Haigh Plantation Gates, Wigan Lane, Wigan. 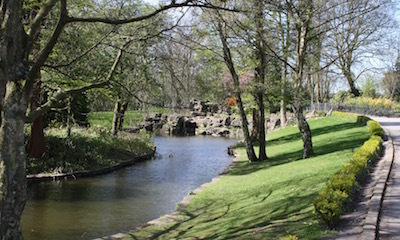 Picture - The duck pond, Mesnes Park, Wigan. 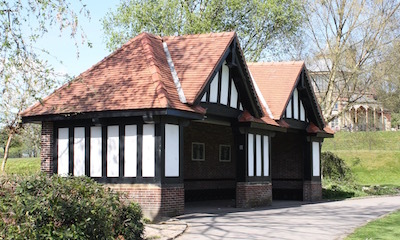 Picture - The Shelter, Mesnes Park, Wigan . © garswood.com. Design: HTML5 UP.